We’d love your help. Let us know what’s wrong with this preview of Murder in the Reading Room by Ellery Adams. Jane’s boyfriend is missing, and she thinks she may find him at North Carolina’s historic Biltmore Estate. Officially, she’s there to learn about luxu Storyton Hall, Virginia, is a paradise for book lovers who come from all over for literary getaways. But manager Jane Steward is temporarily leaving for another renowned resort—in hopes of solving a twist-filled mystery . . .
To ask other readers questions about Murder in the Reading Room, please sign up. One of the reviews suggests that this book may be the end of this series. Is that true? Or just speculation. This has been one of my favorite series since it was first introduced by the author. This book might be my favorite so far. Ms. Adams has a terrific writing style that draws the reader into each one of her books and invites them to stay until the story has been told. She writes interesting, complex characters that are a joy to read. Jane Seward is a terrific character. She is smart, complex, dimensional and multi-layered. The Cover Girls and the Fins and the rest of the cast of secondary charact This has been one of my favorite series since it was first introduced by the author. This book might be my favorite so far. Ms. Adams has a terrific writing style that draws the reader into each one of her books and invites them to stay until the story has been told. She writes interesting, complex characters that are a joy to read. Jane Seward is a terrific character. She is smart, complex, dimensional and multi-layered. The Cover Girls and the Fins and the rest of the cast of secondary characters just completes this series. The mystery, as always involves the secrets that surround Storyton Hall, but this time the author provides the reader with a wonderful twist that I did not see coming. I like where the author is taking the series and it will be interesting to see how the mysteries develop as she transitions her characters into this new vision. Murder in the Reading Room by Ellery Adams was an excellent addition to this series. If it hadn't been for the real world, I've had read this in an afternoon. It is filled with a complex mystery that kept me turning the pages and filled me with some anxiety as to how Jane was going to win this "chess game" against this master and villainous Templar who seemed to be holding all of the answers. Jane and each of the Fins have won my heart and my admiration over the course of this series. I've said Murder in the Reading Room by Ellery Adams was an excellent addition to this series. If it hadn't been for the real world, I've had read this in an afternoon. It is filled with a complex mystery that kept me turning the pages and filled me with some anxiety as to how Jane was going to win this "chess game" against this master and villainous Templar who seemed to be holding all of the answers. Jane and each of the Fins have won my heart and my admiration over the course of this series. I've said it before and I say it again, I want to move into Storyton Hall and become a permanent resident. The plot moved swiftly and the twists often scared me, for Jane, as I was reading. There was also a huge surprise twist that I never saw coming from Ms. Adams which only added to the tension of the story. I do believe that this is the last book in this series. The final chapters seemed to be tying up many story lines that have run throughout this series. I will miss this series if I have surmised correctly but I am glad for the experience of having enjoyed each book. This book was phenomenal! It jumped off the page as soon as I started reading. I kept picking this book up every time I had 2 minutes to read even just one more page. The story kept me turning the pages the whole way through. It was amazing. And the ending!!! Oh my word! I'm not giving spoilers...you have to read it. This series is amazing and this book is the best one yet! If I could simply use one word for this book review, it would be "Wow"! I have always enjoyed this series, and without posting spoilers it is hard to fully write my thoughts. Suffice to say, this latest offering grabbed me from the first page and did not let go. It is a sign that it is a good book, because when I could not read it, I was thinking about it! I strongly suggest you read this series in order, to fully appreciate it. I voluntarily reviewed an advance reader c If I could simply use one word for this book review, it would be "Wow"! I know when I open up a book written by Ellery Adams that it will be difficult to put down. Murder in the Reading Room is a complex mystery that grabbed me from the start. Kept me turning the pages until the very end. I love the characters in this series. I love the story starting out at Biltmore Estates. The descriptions had me picturing everything in my mind as I read. Jane is there to attend a conference, but she is really there looking for Edwin. She finds Edwin and much more. Twists and turn I know when I open up a book written by Ellery Adams that it will be difficult to put down. Murder in the Reading Room is a complex mystery that grabbed me from the start. Kept me turning the pages until the very end. I love the characters in this series. Jane is there to attend a conference, but she is really there looking for Edwin. She finds Edwin and much more. Twists and turns and surprises await in the pages of this book. Storyton Hall is a retreat set in the mountains of Virginia, book lovers from all over the world enjoy the book themed rooms. I received an ARC prior to publication and decided to voluntarily review it. Opinions are my own. Murder in the Reading Room is the fifth book in Ellery Adams’ Book Retreat Mysteries. The plot moves quickly, and the well-developed characters and complex mystery kept me turning the pages. Jane Steward is the guardian of Storyton Hall, a resort in Virginia, which draws book lovers from all over the world to read and enjoy time in the hotel’s book-themed rooms. In this installment, Jane is tasked with rescuing her boyfriend, Edwin, who has been missing for almost two months. She’s convinced Edwi Murder in the Reading Room is the fifth book in Ellery Adams’ Book Retreat Mysteries. The plot moves quickly, and the well-developed characters and complex mystery kept me turning the pages. Jane Steward is the guardian of Storyton Hall, a resort in Virginia, which draws book lovers from all over the world to read and enjoy time in the hotel’s book-themed rooms. In this installment, Jane is tasked with rescuing her boyfriend, Edwin, who has been missing for almost two months. She’s convinced Edwin’s being held captive at Biltmore Estate most likely by those responsible for the recent kidnapping of her twin sons, Fitzgerald and Hemingway, but fears the outcome won’t be as successful. Landon Lachlan, one of the Fins tasked with protecting the members of the Steward family, accompanies Jane to the Biltmore under the guise of being an attendee of the Luxury Lodging Symposium being held there. Jane and Landon are able to locate Edwin, but Ramsey Parrish, his captor, arrives before they can rescue him and puts a stiff restriction on his release. In the process of negotiating Edwin’s release, Jane receives some shocking news. When they find the body of Gerald Tucker, the Biltmore’s gardener, in his cottage, Jane suspects he was murdered and that he died because he befriended them. Upon their return to Storyton Hall, Jane helps with the final preparations for hosting a group of historians who have been touring the United States celebrating the centennial of World War One and learning everything she can about the attendees. She enlists the Cover Girls, her beloved book club friends, to help keep an eye on things and report any shady or odd behavior. Sadly, a casualty occurs during the reenactment of the Great War. Murder in the Reading Room picks up where the fourth book in the Book Retreat series ended. Jane is on her way to the Biltmore Estate under the cover of learning about the management of the large luxurious hotel, but her true mission is to find Edwin, her missing boyfriend. While she is exploring the buildings and admiring the gardens, she engages one the gardeners to help her. But this is a murder mystery after all and instead of helping Jane, the gardener is found dead in his cottage. So once a Murder in the Reading Room picks up where the fourth book in the Book Retreat series ended. Jane is on her way to the Biltmore Estate under the cover of learning about the management of the large luxurious hotel, but her true mission is to find Edwin, her missing boyfriend. While she is exploring the buildings and admiring the gardens, she engages one the gardeners to help her. But this is a murder mystery after all and instead of helping Jane, the gardener is found dead in his cottage. So once again Jane in plunged into a murder investigation. Eventually she finds Edwin only to have his "rescue" lead to yet another mystery. Edwin's captor is convinced the suitcase that Hemingway's wife lost in a train station in Paris nearly a hundred years ago is actually hidden at Storyville. So back they go to Storyville. There are some unexpected twists along the way especially at the end leading me to believe this is either the final book in the series or the characters are going in an entirely different direction! This wasn't my favorite book of the series, but if this is the end of the series, it was a nice finish. Caution. Do not read this book if you have not read the previous book. You will be lost from the first page. I have always enjoyed this ridiculously fanciful series. It's full of family, close friendships, books, and murder. Perfect. It's never believable, though I found this one even LESS believable than the other entries, mostly because of the unconvincing change of heart of one of the criminals from Storyton Village at the end of the story. Still, it was a very enjoyable read and a lovely escape. If I could visit Storyton Hall, I would--in a heartbeat. I'm assuming this is the last in the series...ma I have always enjoyed this ridiculously fanciful series. It's full of family, close friendships, books, and murder. Perfect. It's never believable, though I found this one even LESS believable than the other entries, mostly because of the unconvincing change of heart of one of the criminals from Storyton Village at the end of the story. Still, it was a very enjoyable read and a lovely escape. If I could visit Storyton Hall, I would--in a heartbeat. I'm assuming this is the last in the series...maybe? It seemed to be heading that way, though there are just enough loose ends that I'm uncertain. If it is, it has been been lovely spending time with you, Jane! Jane Steward is on her way to North Carolina to the Biltmore Estates where she believes her boyfriend Eric may be hidden. She is officially on a trip to learn more about luxury hotel management but she is really there to look for secret passages and clues to where Eric is hidden. While visiting one of the gardening staff Jane believes she may have found someone who can help her until he was found dead in his reading room. Jane not only finds Eric but she a lot more than she is expecting. When th Jane Steward is on her way to North Carolina to the Biltmore Estates where she believes her boyfriend Eric may be hidden. She is officially on a trip to learn more about luxury hotel management but she is really there to look for secret passages and clues to where Eric is hidden. While visiting one of the gardening staff Jane believes she may have found someone who can help her until he was found dead in his reading room. Jane not only finds Eric but she a lot more than she is expecting. When they return to Storyton Hall the mysteries continue, can Jane find the answers? I was so excited to read this book. This is one of my favorites series and this book is my new favorite in the series. Storyton Hall is a reader and book lovers dream. I would love to have a location like Hall to visit in real life. Jane her family, friends, and guardians are wonderful, interesting characters that make me smile while reading about their lives and the different events that are being celebrated at Storyton. The mystery is well written with a steady pace and several twists and turns along the way. I recommend this book to fans of Ellery Adams, cozy mysteries, and book lovers. This next chapter of Jane and her family and friends leaves nothing but surprises through the whole book. Good guys become bad guys and bad guys become questionable good guys. If you love books and wish for a place like Storytown Then then this is a book/series for you. If I could have I would have read the whole thing at once, but life seems to interfere at times. This is a page turner, no doubt! The latest dive into Storyton Hall is full of excitement, deceit, and a whole lot of shock. I loved every minute of it. I will admit, by now, I am an Ellery Adams fan and will read whatever has her name attached, no questions asked. This novel was no different and as usual, I was not disappointed. Wow, the surprises in this book kept me reading! Any bibliophile needs to read this series. There are so many book references, some of which made me go look for the books (is there a book that continues the Jane Eyre story -- if so, I want to read it!) Any lover of history will love the offsite setting at Biltmore Estate. It makes me want to go visit it! This is a great addition to this series, which is a must read. Ellery Adams writes superb settings. Such is her ability, a reader would love to travel to her locations and partake of the tempting offerings. If a magic travel agency appeared, I would book a trip to Storyton immediately. I would be drawn to both the public libraries, and the secret library. Who wouldn't wish to read treasures once deemed to precious to be shared with the world? Especially if Mrs. Hubbard where there to prepare your heart's delight. The theme of war and reconciliation is state Ellery Adams writes superb settings. Such is her ability, a reader would love to travel to her locations and partake of the tempting offerings. If a magic travel agency appeared, I would book a trip to Storyton immediately. I would be drawn to both the public libraries, and the secret library. Who wouldn't wish to read treasures once deemed to precious to be shared with the world? Especially if Mrs. Hubbard where there to prepare your heart's delight. The theme of war and reconciliation is stated in the opening epigraphs. Steven Crane writes of the “red animal—war, the blood swellen god. Countering E.M. Forster suggests, “if the mothres of various nations could meet, there would be no more wars.” In the opening, Jane is rushing to another battle in her private war. Her task, to rescue her lover, Edwin from the dark Templars. Missing for nearly two months, Jane is convinced he is being held captive at Biltmore. The stakes are high as these men are from the same group that kidnapped her twins (Book 4). Her search for Edwin is successful in part. The other part includes a shattering find that changes everything. Compounding the event is the death of Biltmore's retired gardener and fellow book lover. Jane knows she is facing a formidable foe. Storyton Hall is hosting another form of warfare. A group of historians have been touring the United States celebrating the centennial of the First World War. They have booked Storyton Hall for a weekend that will feature a reenactment of one of the battles. When another innocent is found dead, Jane wonders if she will ever be able to bring a peaceful resolutin to her own conflict. This appears to be the concluding book in the Book Retreat Series. Adams is beginning a new series, The secrtm book & scone Society. I look forward to reading these new adventures. I received a free copy of MURDER IN THE READING ROOM (Book 5 of the Book Retreat Mysteries) by Ellery Adams in exchange for an honest review. Jane Steward has figured out where she can find her kidnapped boyfriend Edwin. When the rescue doesn’t go as planned, the secrets hidden at Storyton Hall become endangered. A nasty and evil man from a rival organization brings chaos, misery, and death with him to the History Book Retreat. In comparison to human life, how important are the secrets of Storyt I received a free copy of MURDER IN THE READING ROOM (Book 5 of the Book Retreat Mysteries) by Ellery Adams in exchange for an honest review. Jane Steward has figured out where she can find her kidnapped boyfriend Edwin. When the rescue doesn’t go as planned, the secrets hidden at Storyton Hall become endangered. A nasty and evil man from a rival organization brings chaos, misery, and death with him to the History Book Retreat. In comparison to human life, how important are the secrets of Storyton Hall? I enjoyed both this book and this series. This novel was a lot darker than the prior stories in this series. Jane makes more than one huge decision at the end of the book, which makes me wonder if this is the conclusion or if things will progress on a different track. I recommend both this book and this series. I love this series. The characters are so realistic and I feel like I am visiting friends to catch up when I read them. This book was no exception. A group of historians are visiting Storyton Hall and are planning a reenactment on the grounds. Also, Jane travels to the Biltmore to attend a Luxury Hotel Management conference, and to look for Edwin. I love the way Jane and the other characters have grown over the course of the series so far and that the stories always keep me guessing. If Storyton I love this series. The characters are so realistic and I feel like I am visiting friends to catch up when I read them. This book was no exception. A group of historians are visiting Storyton Hall and are planning a reenactment on the grounds. Also, Jane travels to the Biltmore to attend a Luxury Hotel Management conference, and to look for Edwin. I love the way Jane and the other characters have grown over the course of the series so far and that the stories always keep me guessing. If Storyton Hall was a real place, that is where I would go on my next vacation, or maybe I would just move into the village with all of its cute shops and wonderful residents. Ms. Adams has created a place where all booklovers would feel at home. 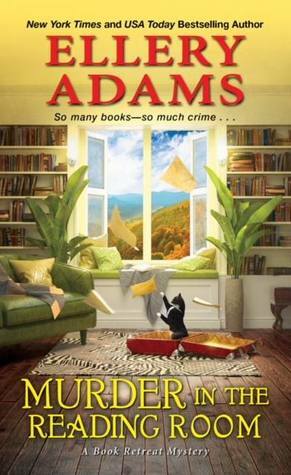 Another wonderful cozy mystery from Adams. This one picks up right where Book 4 left off, so I would not recommend picking this up without having at least read the previous in the series. This story continues with the cliffhanger from book 4 and introduces World War 1 re-enactment, Lost Generation mysteries, and of course, lots of lovely quotes from authors of all types. Books and books are always fun, and a mystery that includes secret libraries is perfect for fans of literature. I received an A Another wonderful cozy mystery from Adams. This one picks up right where Book 4 left off, so I would not recommend picking this up without having at least read the previous in the series. This was an action packed volume and those familiar with Ms Adams know she's not afraid to shake up her characters and her series!! This book takes on a trip to the Biltmore estate for a daring rescue, the shocking reappearance of someone from her past and then home where an accident/murder? makes Jane question everything in her life. How will she handle it, who should she believe and trust and what will the future hold for Jane and all she loves? This is a must read for fans of the series!!! Great cozy mystery! I love the well developed story line. It is finely woven with twists and turns I did not see coming. Ellery’s characters are well developed and believable. The plot twists will have you Googling all night long (sorry you will have to read the book to find out why). Weaving Biltmore Estate into the story was brilliant it it such a stunning property. It’s definitely a book that is hard to put down. I highly recommend this for Cozy Mystery lovers and as a bonus it is part of a s Great cozy mystery! I love the well developed story line. It is finely woven with twists and turns I did not see coming. Ellery’s characters are well developed and believable. The plot twists will have you Googling all night long (sorry you will have to read the book to find out why). Weaving Biltmore Estate into the story was brilliant it it such a stunning property. It’s definitely a book that is hard to put down. I highly recommend this for Cozy Mystery lovers and as a bonus it is part of a series! ***** Secret libraries, fantastic estates, legendary authors, an assistant with war PTSD, a murder mystery, and TEMPLARS! Just short of being an urban fantasy with an amateur sleuth who is the mother of twins, this one is ingenious! Can you tell that I loved it? The publisher's blurb is pretty basic but spoilers are just wrong, much as I'd like to highlight incidents. I requested and received a free ebook copy from Kensington Books via NetGalley. Thank you! I have enjoyed all of the Book Retreat mysteries, and this one was no exception. I love the Storyton Hall setting (would be a dream to go there! ), the characters, and the fun mysteries. This installment in the series takes many of the plot points that have been introduced in the past and weaves them all together. It's a wonderful ride with many ups and downs, and readers will love going on this journey! Another wonderful addition to this series. The plot is full of delightful twists and turns. Adams is always clever in her use of literary themes that are just enough to make the reader smile. I love the intrigue and bits of romance as well as the double lives of the main characters of Storyton Hall. This book has many interesting twists & turns, a great game of strategy and plenty of mysteries. The secondary characters are complex. Lots of book references and great descriptions so you feel like you are there. There were a couple of big surprises in this book, but I won't include any spoilers. You won't be disappointed in this book. Ellery Adams has such a way with fantastical stories!